It's been said that absence makes a heart grow fonder, so it was with very willing and eager hands this week that we received the Droid Bionic, Motorola's latest high-octane, robot-themed assault on Verizon Wireless subscribers. The phone was first announced at CES in the beginning of 2011 and we got to see it in the flesh just an hour later... but then the story took a tragic turn. The Bionic was attacked, killed and then reborn with all new internals. Phoenix-like, the thing is now available for purchase on Verizon Wireless, $300 for a supposedly top-shelf device that packs both LTE connectivity and a dual-core processor. That makes it a first for Verizon, and it also happens to be the thinnest LTE handset yet to cross that carrier's airwaves. Oh, and it has the biggest battery yet, too. Was it worth the wait, then? Maybe. 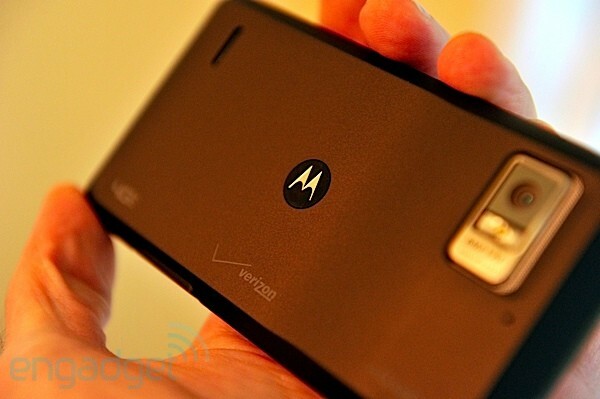 Motorola's Droid Bionic is the first LTE device with a dual-core processor. It's a great phone, but not quite top-shelf material. How would you rate the DROID Bionic? Users of the Droid X or Droid X2 will feel right at home here. Those phones and this one definitely share some design DNA and a similar layout. On the lower-left is the micro-USB and micro-HDMI ports, needed to power many of the wide array of accessories for this thing. On the upper-right lies a solitary volume rocker (no camera button here), while the power and headphone port can be found up top. Finally, an eight megapixel camera sits around the back -- packing the same number of pixels as its predecessors, but now able to manage 1080p video recording. So it's familiar, then, but different. One big difference is the deletion of the physical buttons below the display, which we always liked but found a little too firm. The bigger change is the girth. The Droid Bionic is, at its thickest, 13.3mm (just a tick over half an inch) and it only tapers down a bit to 11.3mm (.45-inch). The X2 is less than 10mm at its thickest, and of course it goes way down from there. 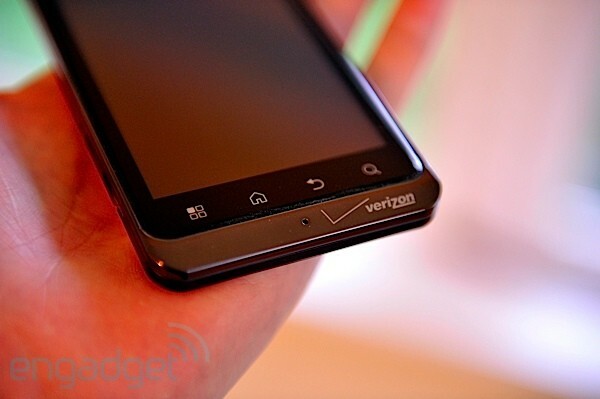 So, while this is Verizon's thinnest LTE phone, it's far from wafer-like. But, at 159 grams (5.5 ounces) it is at least not considerably heavier than the X2. Indeed, in the hand it feels solid but not heavy, refined but not dull. It's definitely traipsing along a fine stylistic line that divides sophisticated and boring, but we'd say it's leaning more toward the former than the latter. The only bits of brightwork are the chrome volume rocker and power button, while a subtly polished metal ring wraps the screen and stretches out a bit below it. That screen itself is Gorilla Glass, as you'd expect these days, and it has an interesting beveled edge to it that means the extents of the surface are very subtly recessed below the edge of the phone's body. This serves as an excellent collection mechanism for pocket lint. Up front is what looks to be the same 4.3-inch qHD display that wowed us on the X2, and it's still impressive here. Very impressive. It doesn't quite offer the eye-popping saturation of Samsung's Super AMOLED Plus displays, but that's not to say it's lacking in contrast, brightness or, indeed, resolution. Viewing angles are as close to 180 degrees as you need, and ultimately this is a screen that has the pixel count and the picture quality to stand up with the best of them. Situated above the display is a front-facing VGA webcam and an LED status indicator, so you can be sure that if you have an unread email this phone will be blinking at you. It's all powered by a 1GHz processor, which again sounds like the Droid X2 but this one is rather different. It's a TI OMAP chip, still dual-core but a bit of a departure from the more common Tegra 2 chips. As to why Moto made a change in maker here compared to its many other phones (including the recently released Photon 4G) we're not sure, and Motorola reps didn't have a solid answer for us, but it does do the business, and a 1,700mAh battery promises decent longevity. More on that in a moment. 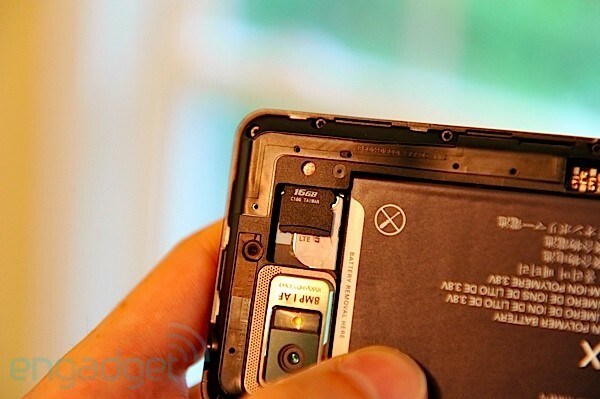 There's 16GB of total storage built into the phone, about half of which is reserved for apps and other system needs. The phone also comes with a 16GB microSD card, though of course you can bump that up to 32GB if you so choose. Taking formatting and everything else into account you'll have about 23GB of empty space ready to accept your music and videos and whatever else you want to apply here, with about 4GB for apps. Naturally this is an LTE device, so you have both that and CDMA on tap. Globe trotters will find dual-band CDMA (900 and 1,800MHz) along with 2,100MHz UMTS support, and all that is augmented by Bluetooth 2.1 and 802.11b/g/n WiFi. We found the Bionic to have good but not great signal reception, but calls were completed loud and clear, and the speakerphone on the back is more than loud enough for some ad-hoc conference calls -- or for stepping away from the phone when you find yourself on indefinite hold. The Bionic makes room for a 1,700mAh cell beneath the thin husk of its back cover, the largest battery yet on an LTE device -- and yes, there's an extended cell coming too. In theory this will provide greater longevity than the current crop of 4G devices on Verizon's network, but given it's less than a 10 percent bump over the Droid Charge and only about 15 percent bigger than that in the Thunderbolt, don't go expecting miracles. We found the phone to be more than adequate for a day of light to moderate usage -- e-mail, web surfing, the like. Mix in a lot of navigation or media streaming, however, and you'll likely be patting your pockets looking for that second battery. And, if you're looking to use this phone as a wireless modem for your laptop, you won't want to stray far from an outlet. We went from a full battery to completely dead in less than three hours of wireless tethering. 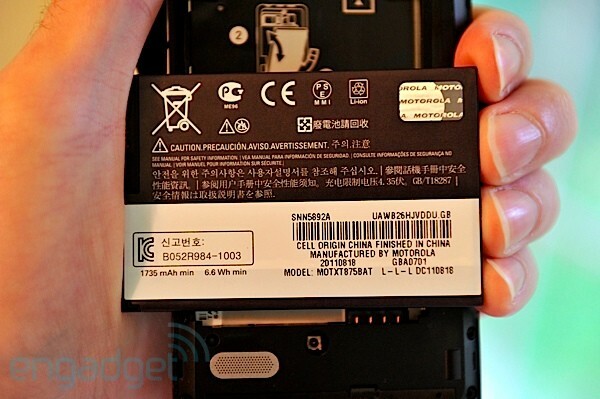 The phone fared well on our standard battery rundown test (a looping video with the screen locked at 50 percent brightness), clocking in at just under six and a half hours but, as ever with smartphone batteries, your mileage may vary. The Droid Bionic is running a (lightly) customized version of Android Gingerbread (2.3.4) that includes the latest Google Talk with video chat. Unsurprisingly, there's also a selection of less interesting apps pre-installed here, things like Blockbuster and Let's Golf 2. We did have success uninstalling some of these, but for the others you will at least be able to hide them thanks to one of Motorola's Android customizations -- application groups. Just create a group of the apps that you do want to see and set the phone to display that set by default. Out of sight, out of mind. It's certainly not all crapware. QuickOffice is a welcome addition to the stock build, and IT types will certainly enjoy the Citrix Receiver. MOTOPRINT is an app that will let you print directly to compatible printers on your local network, or to those more reluctant or non-networked ones through a piece of software that can be installed on a desktop. That software is unfortunately PC-only, but ZumoCast is available for OS X as well. This is an app that lets you stream media directly from your computer to your phone, handling all the transcoding and other mess internally. The problem with this app (and with the Netflix app, which is compatible) is Verizon's relatively new tiered data plans. You can, of course, get cozy at home on WiFi and not worry about any surprises on your bill at the end of the month, but that rather defeats the purpose of having an LTE device in the first place. That's not a problem with this device alone, and it'll only become more of a concern as Verizon adds more LTE devices, but we're sorry to say that bandwidth anxiety is now joining battery anxiety to make us even less comfortable in getting the most out of our phones. Verizon does thoughtfully include a data usage widget which updates in more or less real-time, so if you're heading over your limit you'll at least know before you hit the precipice. But, we've found this widget counts data used while tethered as well, which is a definite problem since you'll have two separate pools of data to keep filled. The Android customizations here aren't restricted to widgets, though, with Android being skinned similarly to how it was on the X2. We generally liked the customizations there, and we do here as well. The predictive keyboard is reasonably accurate and, thanks to the healthy screen size, is friendly for even generously-sized thumbs. The five home screens are, naturally, completely customizable and, with a double-tap of the home button, you can zoom out to see them all at once. The custom lock screen gives you easy access to mute your phone, and has the macho Droid look we've come to expect and, generally, tolerate on these devices. You'll also be treated to a typically red and swirly bootup animation should you start this thing cold -- which takes 50 seconds, by the way. 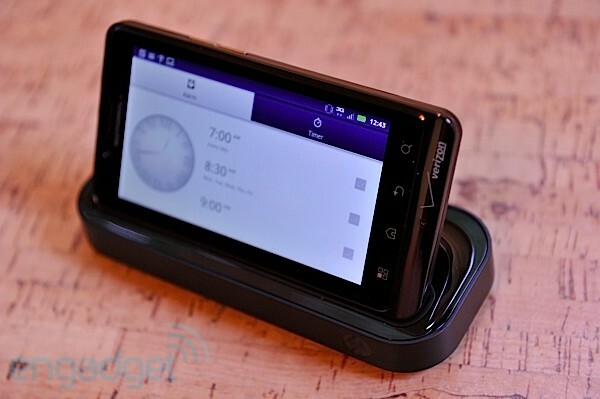 In sleep mode the phone will still use a bit of battery life, but starts up in a much more teneable two seconds. Again, overall we never felt like the phone was struggling under the software here, always acting responsively to our touch. We didn't encounter any repeatable bugs, either, which is always a concern on a new handset. This seems to be the same eight megapixel unit that we saw on the X2 and the X before it, and it looks to deliver the same results here. Pictures are a bit underexposed at times, lacking contrast. The autofocus lens does do great work on close-up macro shots, but we did find focusing to be slow in some situations. This resulted in a few seconds worth of shutter lag in some cases, which made capturing images of our impatient canine models rather challenging. Video recording has been bumped up to 1080p and the resulting quality improvement is noticeable, but we did see some focus hunting in the resulting footage, particularly when filming closer subjects. Still, it'll more than suffice for recording your two best friends taking turns chasing each other around the yard. As with the Atrix, Motorola really pulled out the stops for Bionic accessories, so prepare for eager salesmen and saleswomen who will be doing their best to up-sell you. Which add-ons are worth your time? Read on to find out, but it's important to note that almost all of these will only work with the Droid Bionic. 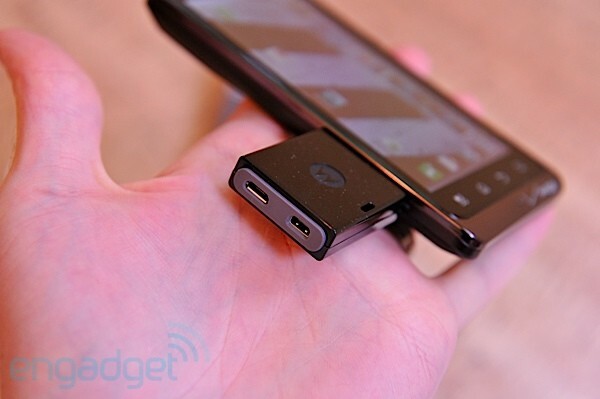 Despite the plethora of Moto devices that offer the same micro-USB and micro-HDMI placement. So don't look at any of these as an investment that you can possibly use with your next Moto handset -- they'll be obsolete right along with your Bionic in a couple of years. Little here has changed since the Atrix on this, and while it is nice to see this little zombie laptop continuing on, it's disappointing to see the implementation hasn't changed a lick since before. You're still looking at a sleek, slim design housing an 11.5-inch, 1,366 x 768 resolution display plus a sizeable internal battery that will deliver between eight and 10 hours of life, even recharging your phone while it's plugged in. Those things are just fine, but sadly the keyboard is still unnecessarily small and cramped, the trackpad is big but unresponsive (and doesn't support gesture scrolling), the left and right mouse buttons frankly feel broken and -- most troublingly -- performance is simply not good. Pop the phone in and you're greeted with the Webtop environment after a few seconds, which is again little-changed from before. You're presented with a windowed view of what's on the phone, which you can use the keyboard and mouse to clumsily interact with -- even sending text messages and the like if you wish. But, if you wanted to just use your phone you'd be far better off just pulling it out of the dock. The real point of this is to get to the few other apps that are accessible on there, with Firefox being the only one that's genuinely worthwhile. We're talking Firefox 4 (a mere two major versions behind the status quo) with Flash 10 support, and performance here is only slightly worse than a $199 netbook doing its damndest to get by with an aged Atom processor. 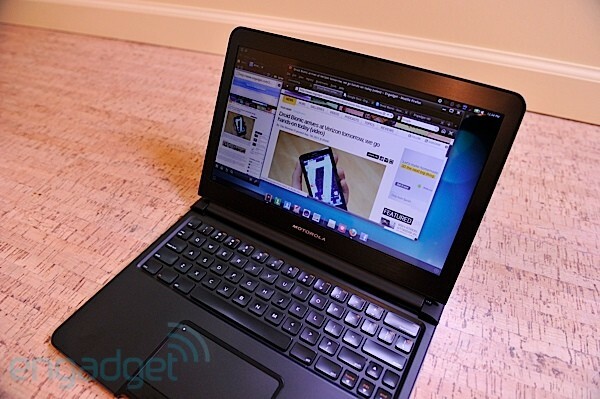 Chances are that netbook would have a better keyboard, too. We love, love the idea of plugging a phone into something and having it be the brains of the operation, and hopefully Google brings Android and Chrome OS together into some sort of beautiful partnership down the road, but as it stands this is simply not worth the money -- even with the $100 discount Verizon is offering should you opt for a tethering plan. This is the most comprehensive of the various non-laptop docks that are available, and naturally the most expensive. For $100 you get a device with HDMI pass-through and three USB ports, plus a 3.5mm output for analog speakers, too. You can configure the Bionic to pop into webtop mode as soon as you dock in here, and with an external HDMI monitor plus a USB (or Bluetooth) keyboard and mouse, you can use this to turn your phone into a little desktop replacement. Assuming you spend more than $5 on that keyboard and mouse you'll find the overall experience to be preferable to the Lapdock, but you'll still have to deal with that lackluster performance. 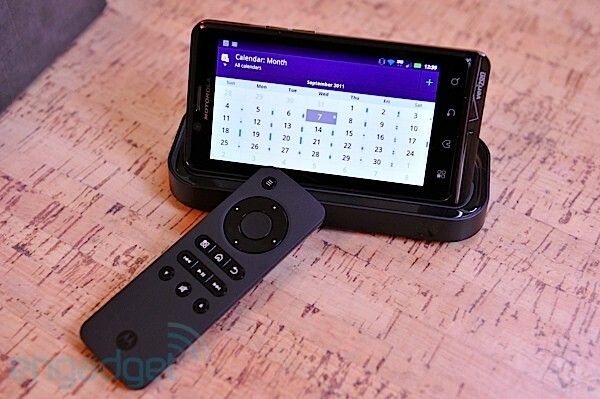 The included remote control does mean you can control your phone from across the room, which could make this a compelling option if you're looking for a media player. But, the price here is just a bit dear. This guy loses the HDMI output and the trio of USB ports compared to the HD Station, but keeps the audio output. This is is a great option if you're looking to charge your phone overnight and use it as an alarm clock or media player. Without a remote you'll need to stay within reach, but for the $60 savings we can probably manage to get up off the couch if we need to change playlists. The Vehicle Navigation Dock is a fancy name for a fairly standard windshield or dash mount for your phone, including a micro-USB pass-through so that you won't have to manually plug in that cable every time you dock your phone. 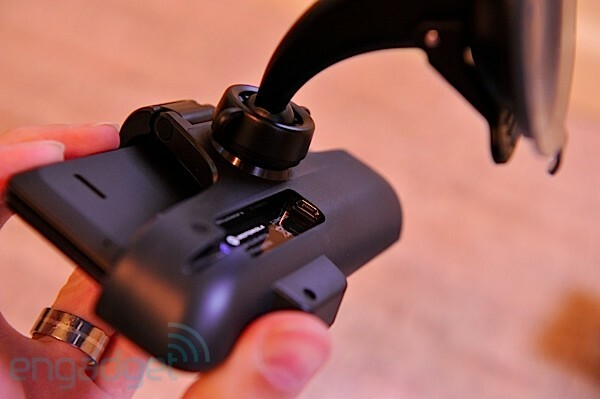 However, while it does include an audio patch cable, the dock itself does not include a 3.5mm audio out, meaning you'll have to jam that in the headphone jack on your phone every time you dock the thing. Still, we'd say this one is worth the money. This is a little matchbox-sized thing that has micro-USB and micro-HDMI inputs on one side and micro-USB and micro-HDMI outputs on the other. World's least effective port expander? Not quite. Plug this guy in and you'll kick the phone into Webtop mode, providing video out to an HDMI monitor. The phone itself is turned into a big scrollpad, with the soft keyboard available as well. Or, you can connect Bluetooth peripherals if you're looking for something a bit more manageable. We certainly would. 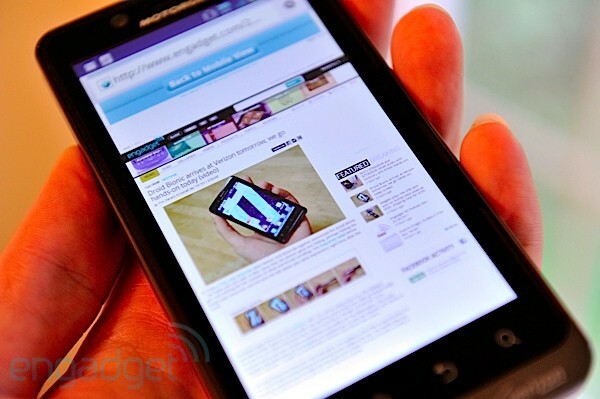 The Droid Bionic is exactly what we wanted the Droid X2 to be: that phone plus Gingerbread and LTE. So, happy day, right? Well, not quite. The X2 dropped over three months ago, and while that seems like just yesterday, given how quickly things are moving these days that's absolutely ages ago in the world of the smartphone. Since then we've been teased by the GSII and, with the Note, seen a glimpse of just how fast the next generation of phones is going to be. The Bionic is a great choice for right now, the best combination of wireless and device speed that we've yet seen on Verizon. For that reason alone it's a smart purchase -- particularly if you've been hanging on to that OG Droid for months and months waiting for a phone like this to come along. But you should know that this isn't a world-conquering device, the kind of thing that will leave you walking tall and proud for months and months to come. If you're okay with that, then buy with confidence.